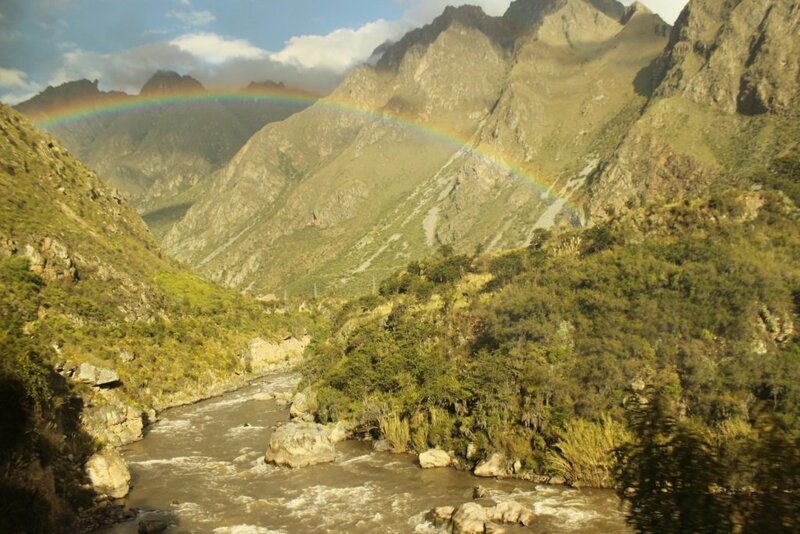 The rain is pouring down when my brother Anton and I got of the train from Ollantaytambo to Aguas Calientes. It is after midnight and we need to find our hostel. 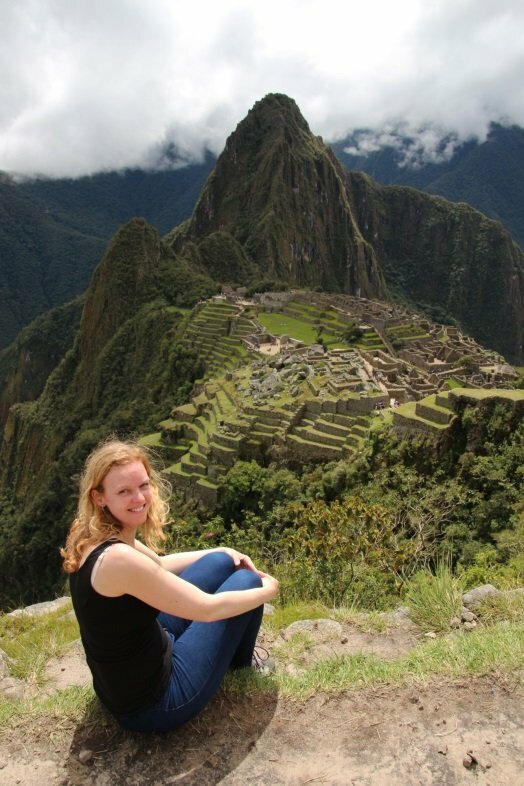 We had a 2 hour delay and I really want to catch some sleep before we visit Machu Picchu tomorrow, no wait, this morning! Our map isn’t helping and it seemed we didn’t stop at the official train station. We wandered around, asked for our hostel or our street, but the few people around didn’t know where we needed to go. Finally, a guard from a big hotel pointed us in the right direction. Close to 1 AM we knock on the door of our hostel. The friendly lady who we must have woken up is friendly and shows us the room. We hang our soaked clothes to dry and go to sleep. At 5.30 our alarm buzzes. When I open my eyes, I can hear it is still pouring rain. I’m really not going to walk in the rain and I want to go sleep a bit more. My brother finally agrees and we set the alarm again at 7 AM. 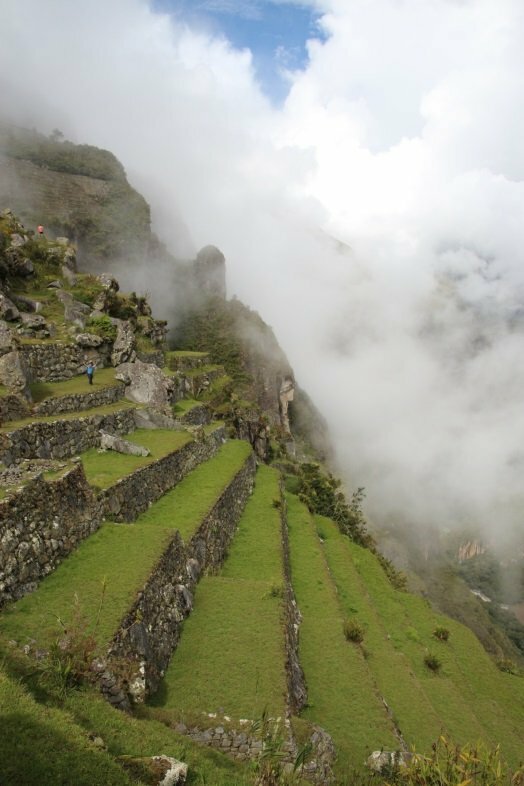 The reason why we went to sleep again; We can take the first bus, arrive with he first group of people at the UNESCO site of Machu Picchu, but then have no view because of all the rainy clouds around the area. 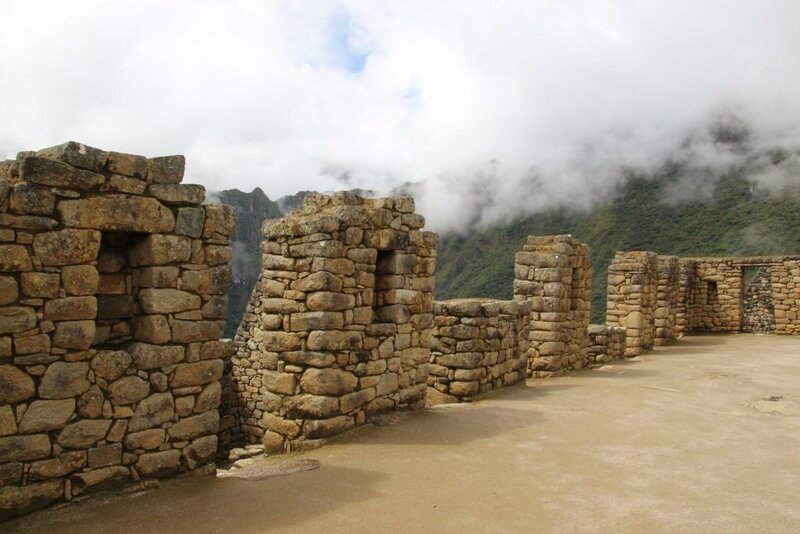 It is better to wait and hopefully get a clear view over the old Inca city. I still felt sleepy and had problems to open my eyes. The rain appeared to be gone, but there are still heavy loads. We bought a simple breakfast/lunch in Ollantaytambo. We made the sandwiches with tuna ate one and brought the rest of the sandwiches. 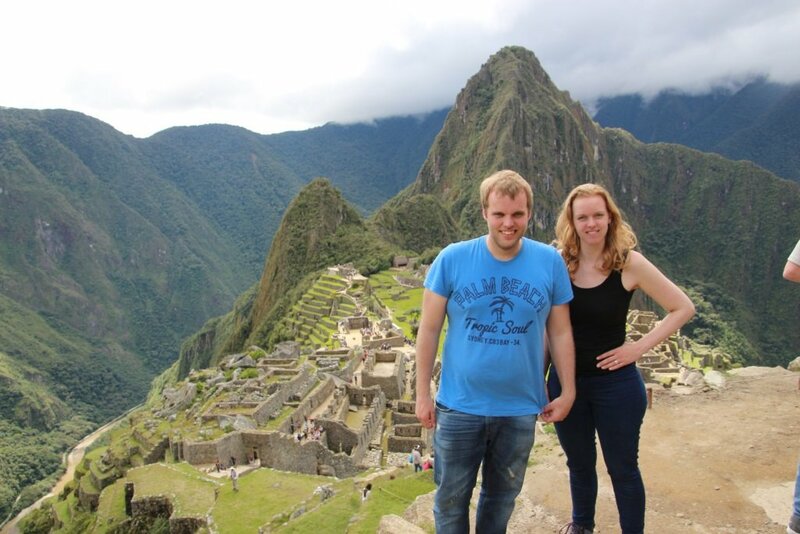 The bus took us to the entrance of Machu Picchu in only 20 minutes. With 25 dollars a return ticket I think this is really expensive, but we don’t have the time to walk to the top where the entrance is. Also in mind we’re gonna walk all day, this is a better start. Even it is already 8 AM it is not too crowded. First we walked to the guards house. From here the view supposed to be the best. The clouds are slowly vanishing, but the view isn’t at its best. 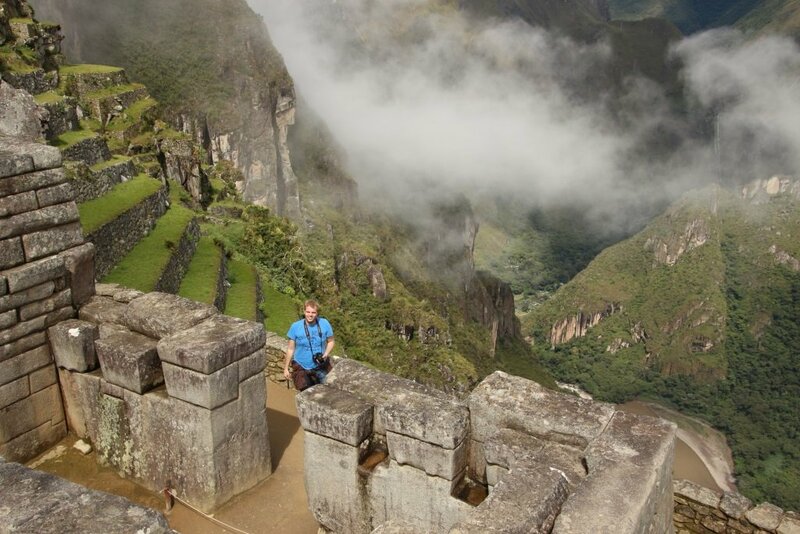 We decided to explore the massive Machu Picchu Inca town. 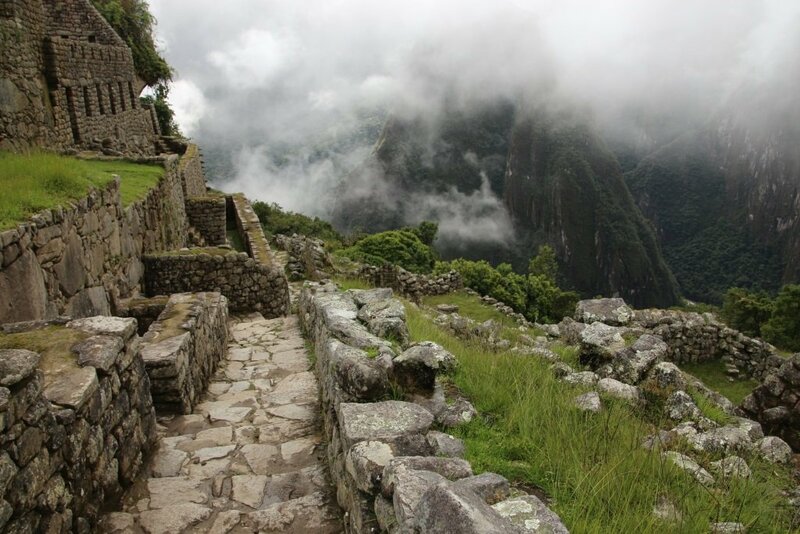 The city is assumed to be build around 1450 at about 2430 meters above sea level in the jungle. Just over 100 years later it got abandoned. Till now they still don’t know why. The jungle overgrew the site and it only got discovered in 1867. 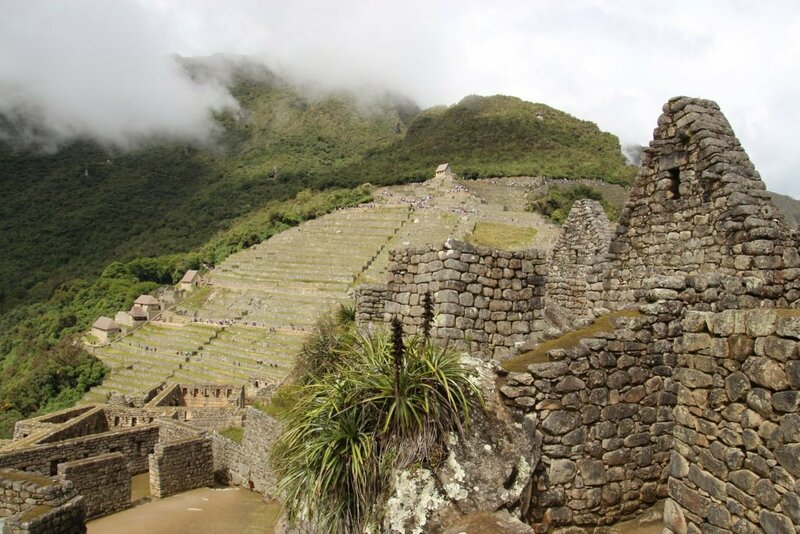 Then it took more than a century before it finally became on the list of world heritage site. Overlooking the old city and just imagine how people would live here. You almost can see the people doing their daily life, walking around in the city. It has been a dream for me for such a long time to visit this place and it almost felt surreal to stand on the ridge and have this amazing overview. Wandering around in the big city, having loads of viewpoints. We even saw a few lama’s wandering around. As the time is ticking by, the sun is coming gently thought the clouds. We again walked to the guards house. 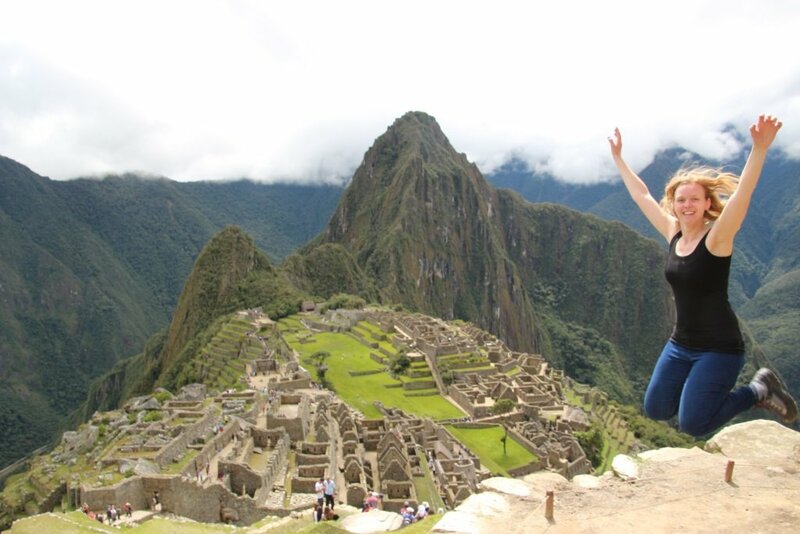 And finally got to see Machu Picchu in full glory! Amazing! I fully enjoyed this day. Even we didn’t do one of the hiking. 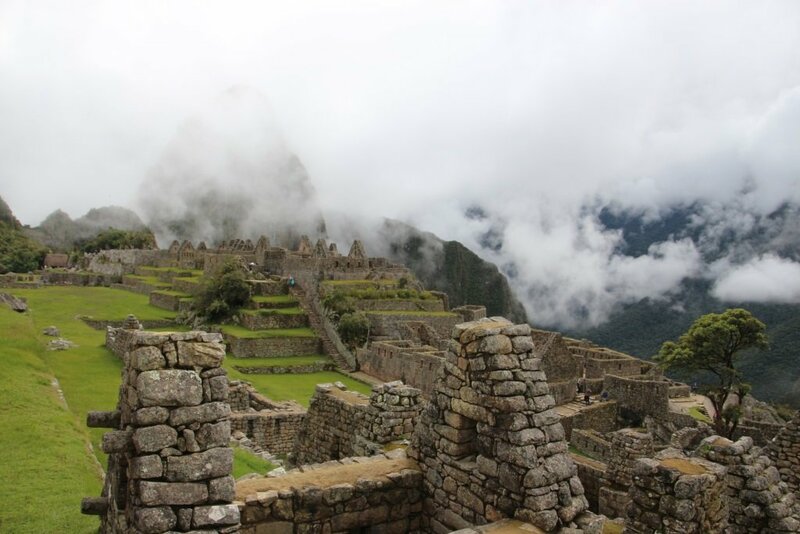 Cuzco is a major starting point for most of the people to start their hiking trails to Machu Picchu. 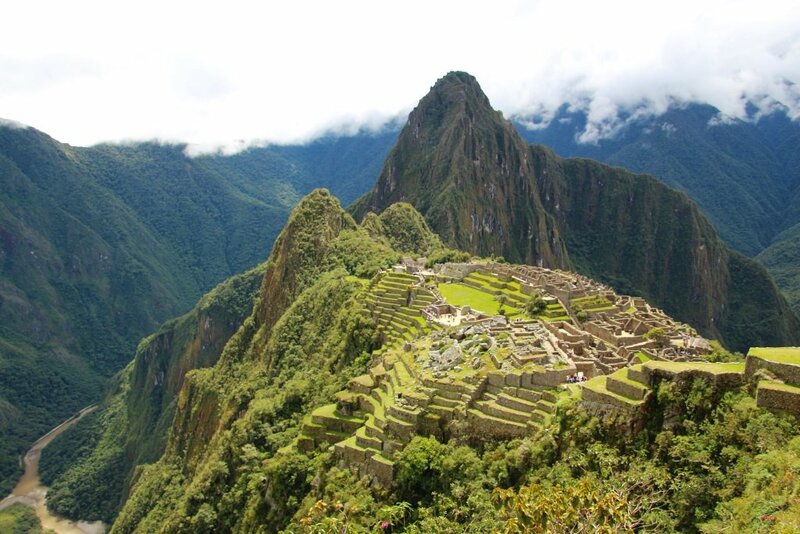 The most famous one is the Inca trail, a 4 day trek with the grandne final at Machu Picchu. As I didn’t want to hike for 4 days we had to search for an alternative. After a day walking around, we had 2 options. The cheap mini bus which drops you off at Santa Teresa, here you’ll have to change bus to Hidro-electrica. From here it is a 2 hour hiking to Aguas Clients. I heard the hiking is easy and has a nice scenery. With only 80 soles, this is by far the cheapest option. Since this would cost us 3 days and long hiking all together, we decided to take the expensive option, which is going by train. We got ourselves a train ticket from Ollantaytambo to Aguas Calientes. 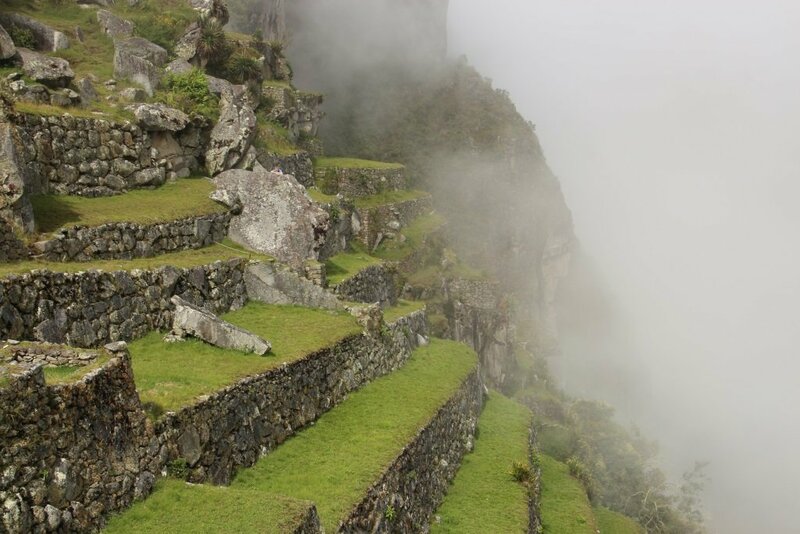 You can travel from Cuzco all the way to Aguas Calientes, but this makes it even more expensive. 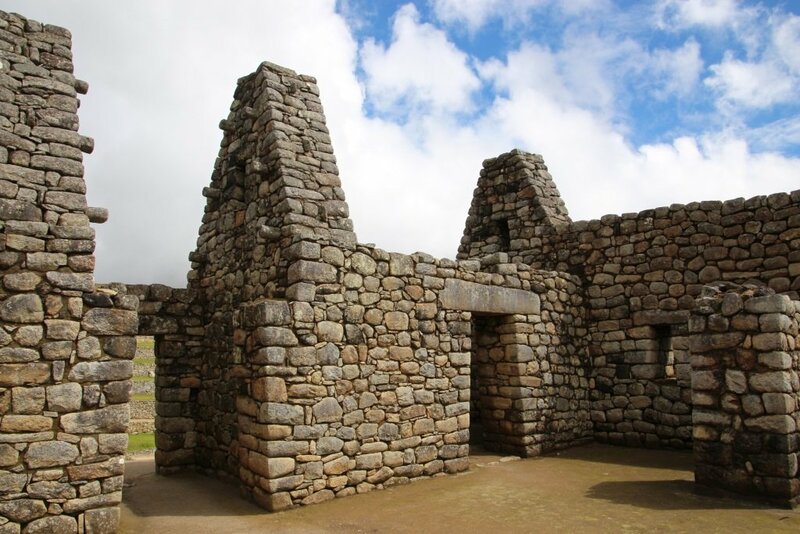 To go to Ollantaytambo you can either take a mini bus, or you can do the same thing we did; Book a sacred valley tour and let them drop you off in Ollantaytambo at the end of the day. On the way back we got a minibus right after the train, which was easy and straight forward.